At 26″ x 30″, Noah’s Ark is the largest piece I’ve ever made. Everyone has their own scale and mine tends to be small. Even if the outside dimensions of a piece are large, I will fill it with smaller items. Looking at this picture now, I see large areas that would not escape my present-day appetite for embellishment. It’s tricky to keep the all over design working, so that it draws you in first and then you can appreciate the detail up close. 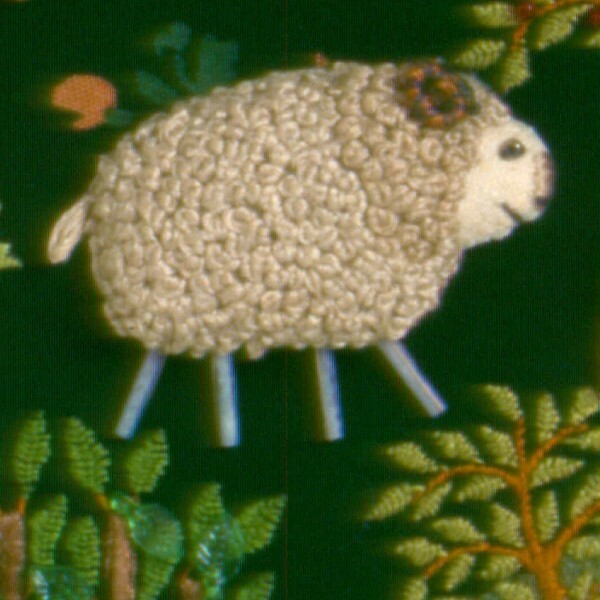 At this time, in 1985, I had stopped making the pins, but was still designing small animals of the same size to use in my fabric relief pictures. You can read a 3 part story about my pins in earlier blog posts here. Showing the story of Noah was an opportunity to continue figuring out how to make a variety of animals. It was also a way to play around with arranging them together in a landscape. The background fabric is cotton velveteen, which I dyed with a spray bottle, building up layers of color, giving it a variegated, stippled appearance. The border is made from an upholstery fabric remnant that I remember finding in a bargain bin at a fabric store in Berkeley, California. During this time, I was hand embroidering the leaves on the trees and adding some leaf beads as well. The fabric is machine appliqued, something I would give up shortly after this in favor of hand stitching. I came to dislike the uniform, flat stitches and put my sewing machine away for years at a time. It’s fun to look at this piece and see early examples of human figures and animals that I will continue to rework and develop for another 25 years. This entry was posted in Animals, Fabric Relief, Pins by Salley Mavor. Bookmark the permalink. Sally, your work is such a marvel! This is delightful beyond words and so fun to see your process. Creation love you. Carolyn C. agrees totally with the previous Carolyn. Your work lifts my spirits, something I need right now, even more than usual. No words to describe how wonderful/charming and well done thi sis! I love it all but the elephants have stolen my heart! Your animals faces and bodies seem to say “happy to be on dry ground again” 🙂 I love your work! I bought some of your fairy dolls and kits a few years ago and just recently discovered your blog. I feel fortunate to learn about the steps in your creative process and your thoughts and feelings about it. I was also very moved by the story about your mom and the many, many hats she made for those she loved. Thank you for taking the time to share these things. I was having a bad day until I saw your post of Noah’s Ark, now I am once more inspired. Thanks for sharing. You really are an inspiration! I love the detail you put into your work. It’s so wonderful to hear that my work can help lift a person’s spirits. Thank you to all of you who have left comments. It’s also true that the process of making and sharing what I make gives me a sense of well-being. Writing posts for this blog has helped me endure these 6 weeks of not be able to sew since I broke my wrist. The cast comes off on Wed. and then I’ll be starting hand therapy. I expect to have a full recovery and be stitching again by spring! Hurray- the cast is coming off! I love the alligator and the hippos. Such a fun piece. All of the animals are delightful but I am especially fond of the hippos! This is the first piece I ever saw of yours, Salley, and I was an immediate fan and started looking for more. Thanks for revisiting it. It remains a favorite for me. Oh, my word, those prickly hedgehogs are so cute! It is such a charming piece of needlework! Do you have a book or kit on instructions for doing something like your Noah’s Ark?